Happy Monday to everyone! 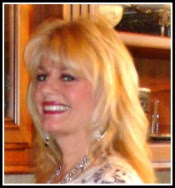 This week on Red Couch Recipes I will be featuring recipes for the 4th of July. 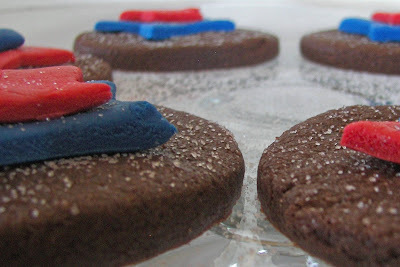 I start out the week with this recipe for Patriotic Chocolate Rolled Sugar Cookies. I have been eyeing this recipe on AllRecipes for a bit; I adapted it slightly. They are called the Best Ever Chocolate Cutout Cookies and they didn't disappoint! They are like a thin brownie and oh so yummy! I topped the cookies with marshmallow fondant stars. 1. Sift together the flour, cocoa, baking powder and salt; set aside. In a medium bowl, cream together the butter and sugar until smooth. Beat in the egg. Gradually stir in the sifted ingredients to form a soft dough. Divide dough into 2 pieces, flatten and wrap in plastic wrap. Refrigerate for 2 hours or put in freezer for 15 minutes or until firm and ready to cut out cookies. 2. Preheat the oven to 350 degrees. On a lightly floured surface, roll the dough out to 1/4 inch in thickness. Cut into desired shapes with cookie cutters. Dough is sticky so be sure to add more granulated sugar to the rolling surface as needed. Place cookies 1 1/2 inches apart onto cookie sheets. 3. Bake for 7-8 minutes in the preheated oven. Allow cookies to cool on baking sheet for 5 minutes before removing to a wire rack to cool completely. Place the marshmallows and water in a large microwavable bowl. Place in the microwave and microwave 30 seconds until the marshmallows are beginning to melt. Remove bowl from microwave and stir and repeat until completely melted and blended together. Place in your large Kitchenaid or other heavy duty mixer bowl. You will need a powerful mixer to blend this. Use your bread kneading hook. Add the 2 lb. powdered sugar and the almond extract. Begin to mix the dough at a low speed. Mix until completely blended. Divide dough into two and color one half with red coloring and one half with blue coloring. The fondant will be warm at this time. You will want to let the fondant cool ; place in Ziploc bag to save for later use. Roll dough on parchment and cut out with small star cookie cutters. I used Wilton cookie cutters. If the dough is sticky, add more powdered sugar. Brownie cookies?? 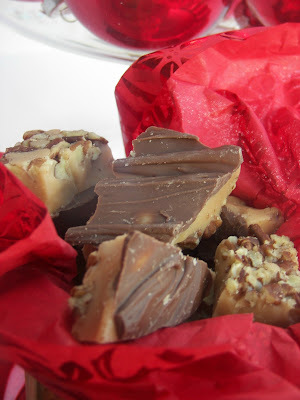 Oh yum- we'll have to gve these a try! These are really cute and festive. I need to try out some 4th of July recipes. We went to the Patriotic Fireside last night and it was great at the Marriot Center. We have never done that before. Have a great 4th. We'll be at Stadium of Fire for Carrie Underwood. Seriously SO CUTE!! What a creative way to decorate. how cute are those! very creative. Your cookies are perfect for the 4th of July. I'm so happy to have a recipe for marshmallow fondant. Thanks for sharing and have a great holiday weekend. Now, I have to find time to make these for the Fourth! Too cute! 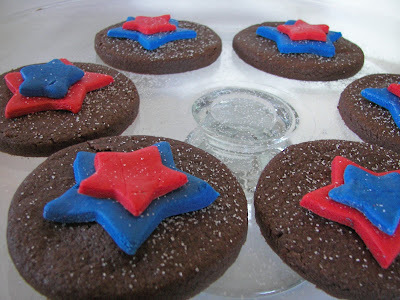 Your USA patriotic cookies look delightful!! MMMMMMMMM,...Now, I can even make them as an outsider of the USA. I live in Belgium! !